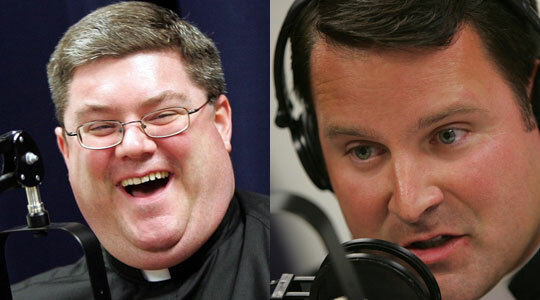 Summary of today’s show: Scot and Fr. Chris preview the prayers of the new Roman Missal coming to our parish Masses on the First Sunday of Advent, including changes to some very familiar prayers we now pray by heart. Using recordings of some of the prayers being chanted, the panel discuss the rich meanings they hold and reveal. 1st segment: Scot welcomed Fr. Chris back to the show. Fr. Chris said he’s thrilled to have the seminarians back at St. John Seminary. It’s great to have the chapel full again with a complement of earnest young men. Scot saw it firsthand last Thursday, Friday, and Saturday, giving them presentations. It was wonderful to see 83 seminarians all in one place. Fr. Chris said you see the Lord’s hand in each of their lives. Cardinal Sean celebrated the opening Mass where he quoted Pope Benedict at length from his address to Spanish seminarians in Madrid last month. Scot said today is a transition for him and his family, celebrating the end of summer yesterday, and then today the commuting patterns coming into work have changed with everyone back and work and kids back at school. Another major change in the Church will begin at Advent with the new translation of the Roman Missal, but also new chats for Mass that could be sung in parishes this past week. Fr. Gaspar will talk about that today. Fr. Chris said it’s an exciting time. 2nd segment: Scot and Fr. Chris welcomed Fr. Gaspar back to the show. Scot said Fr. Gaspar has several roles, including working on preparing us all in the archdiocese for the upcoming new Roman Missal. Fr. Gaspar said the work began in earnest a year ago to prepare priests and people. On November 27, we will have a new Roman Missal with some changes to the prayers we pray. The Roman Missal is the new term for the book of prayers we use at Mass. That book is currently called the Sacramentary, but it won’t be called that anymore. This is the largest change in the Liturgy since the Second Vatican Council. One of the first things the council did was write a document on the Liturgy. Scot said how we pray informs how we believe. The words of prayers are very significant. Scot said the objective of the new translation was to correct the problem that our English translations did not accurately reflect the Latin texts and we weren’t praying the same thing as Catholics in other languages. The Church always gives us our prayers in Latin and then those are translated into many languages. Fr. Gaspar noted that at World Youth Day in Madrid, Pope Benedict prayed in Spanish and the Spanish responses were more like the Latin than our English ones were. Fr. Gaspa we are not just being faithful to the Latin text, but to what is deeper than the Latin text. The Mass is composed of words that come right from the sacred Scriptures, which are divinely inspired. When the priest says, “The Lord be with you”, the people will respond, “And with your spirit” which comes right from St. Paul’s writings. The people’s response is a direct reference to the priestly consecration at ordination. Fr. Chris said it seems a richer translation, and the US is one of the last places in the English-speaking world to start using the new Missal. In the 1960s, when the Mass was translated from Latin to English, they wanted to make the prayers as easy for people as possible. Scot noted many people want to read the changes in political terms of liberal and conservative, but this is about praying together in one voice. Fr. Chris said we’ve been praying these prayers for a while, and this gives parishes a chance to focus on the liturgy and explain it. Fr. Gaspar said what we’ve been praying in Mass has not changed, but how we express them has changed. He said the Archdiocese has been actively encouraging the people to study the words of the Mass. More than 3,000 people have gone through workshops with the new Missal. The most common concern he hears is that this is a step backward in the church and going back to Latin, but that is not true. In the 2000s the Vatican issued a document called Liturgiam Authenticam to encourage the translation of the Latin to be more authentic. Scot brought up the example of the Penitiential Rite. Fr. Gaspar said the new translation is more faithful to acknowledging who God really is. So in the Pentitential Act (Confiteor), we will say “through my fault, through my fault, through my most grievous fault.” When we hurt someone we love, we don’t just say sorry once. If we hurt God the Father who loves us so much, we need to find ways to say I’m sorry: “PLease forgive me. I can’t believe I did that. I’m so sorry.” It’s a litany of sorrow and apologizing. Scot introduced a recording of the Gloria as it is sung in the new translation. (All recordings are available online at the New Roman Missal resources page at BostonCatholic.org.) Parishes have been given permission to start singing the new parts of the Mass ahead of Advent, including the Gloria. Scot said the new translation of the Gloria has more words than the old translation. The first part praying for “all people of good will” comes right from the Gospel of St. Luke (chapter 2:14), which is faithful to what the Latin is saying. We hope that all people have good will. Fr. Chris said it will take time for us to become re-adjusted to the new prayers, but this is a good opportunity to slow things down and take seriously and ponder the mystery and beauty of the liturgy. Scot said his sense is that the old translation tried to be as efficient as possible, but lost the richness of the language. The next phrase includes “begotten” as a description of Jesus. Fr. Gaspar said this word, like “consubstantial”, may not be familiar to us but they are full of meaning. HE noted in the creed that we now say that Jesus is “one in being with the Father”, but that’s vague. We are all one in being with the Father in a way, but the Son is consubstantial with the Father, of the same substance as the Father. He is not just born of the Father, but is begotten of him. The relationships between the persons of the Trinity are more clearly expressed in theological language. We don’t need to understand all these words the first Sunday of Advent. We can spend years coming to understanding of all these words. Fr. Chris said “begotten” is an essential word: Wars have been fought and heresies declared over the understanding of the word. All of these things have important ramifications for what we believe and its essential we reclaim this language. Scot said with something that is more difficult to understand anyway, more precise language is better. Scot said that one of the bigger changes is to the Creed. Now instead of saying “We believe,” we will now say, “I believe”. By moving to the first person we have to proclaim our own belief, not just more generally the teaching of the Church. Fr. Gaspar said this is one of the most significant changes in the Mass. The Creed isn’t just a personal statement of faith, although it is, but it’s also the statement of faith of the Body of Christ. We have to believe what we are saying with the mystical body of Christ in the Church. When we pray as the one mystical Body of Christ, we are one. There is no division in the Body of Christ. When we are gathered by the Father in the Son, we become one with the Son and that’s why the Eucharist is the most important thing that we can do. We offer the perfect sacrifice that brings the world salvation and we can only do that in person of Christ. Another change is that we now pray about things “visible and invisible” while we will now pray for things “seen and unseen”. While something may be unseen, it may not be invisible. If my wife is not present, she is not invisible. We are reclaiming the reality of creation that there is a spiritual reality that is only seen by God. If the angels aren’t visible to us, they are visible to God. We will also pray that Jesus was “incarnate” of the Virgin Mary. It means that he literally puts on flesh. Now we say he is “born of the Virgin Mary”, but the incarnation of the Christ isn’t on Christmas, but on the Annunciation, when Christ is in the womb of Mary at her Yes to the Holy Spirit. Life begins not on the day of our birth, not on the day we are conceived. Scot introduced the recording of Memorial Acclamation A, which will replace “Christ has died, Christ has risen, Christ will come again.” Scot said one of the texts he will miss the most is this old text. The new text is “We proclaim your death O Lord and profess your resurrection until you come.” It combines several of the old acclamations into one. The verbs proclaim and profess are significant. There is a theological richness to why we proclaim. Fr. Gaspar said the Liturgy is a celebration of the Death of the Lord. Fr. Gaspar said many people, including bishops, are upset at the loss of the old acclamation. This acclamation was never in the Latin missal and was created just for the English-speaking Church. The memorial acclamation is meant to be addressed to Christ and acclaim what He has done for us. The old acclamation is just a recitation of what Christ did, but doesn’t address Christ. The new acclamations include a sense of us in relation to Christ. It is a mystery that includes us in this proclamation. Christ’s death sets us free. Fr. Chris said he is now convinced. He thought he’d miss the old acclamation, but now he’s looking forward to the new ones because of this meaning that Fr. Gaspar has explained. The supper of the Lamb is right from the Book of Revelation, which talks about the ongoing wedding fest of Jesus, the Lamb of God, with his Bride, the Church, and our participation in the Mass is a foretaste of heaven. “Entering under my roof” comes right from Scripture and the prayer of the centurion who prays that Jesus will come and heal his daughter, but tells Jesus that he is not worthy that Jesus should enter under his roof. Jesus sees the faith and the daughter is healed. Scot encouraged listeners to prepare themselves before the First Sunday of Advent with the resources listed here.